Yesterday I was feeling Vietnamese….today I feel Italian. I’m serving up bruschetta! Bruschetta is an antipasto generally made from grilled bread rubbed with garlic and drizzled with EVOO, salt and pepper. It’s topped lots of different ways but I’m sticking with my beloved tomato. 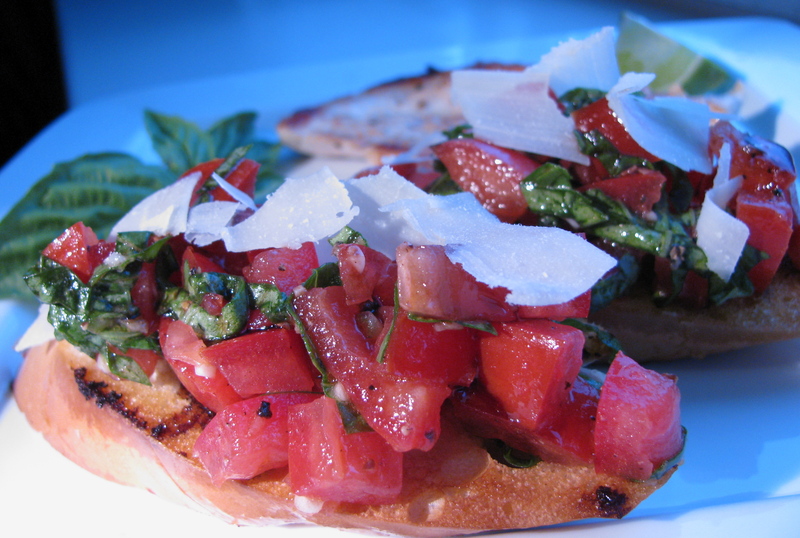 Rather than grill the bread…I fry it and top it with vine ripe tomatoes, garlic and basil. It’s finished with a bit of aged balsamic and parm. I know this is an appetizer but tonight it stole the show and upstaged the chicken. Bye Bye Birdie! Heat a large sauté or fry pan on medium high heat. Slice the tomato in half; remove the core and the seeds. Then slice each half into thirds and dice small. Crush the garlic using the blunt side of the knife. Remove the skin and mince it finely. Chiffonade the basil. Check out the following video to see how to chiffonade. Combine the diced tomato, minced garlic and chopped basil in a medium bowl along with 1 Tbsp EVOO, salt and pepper. Stir to combine the ingredients. Cover and refrigerate for 15 minutes. Slice the bread at an angle to create long, ½ inch slices. Add the remaining EVOO to the pan. Fry the slices on both sides until golden brown. Top the fried bread with a few spoonfuls of the tomato mix, a sprinkle of parm cheese and a drizzle of balsamic. You can cut calories by sticking the bread under the broiler and not frying it. It’s just as tasty. Don’t like garlic? Try shallots instead…they’re just as good in this recipe. Can’t find basil? Try mint instead. And before you judge they’re cousins so YES they can substitute one another in most cases. Can’t find aged balsamic? S’ok. Take ¼ of regular balsamic and simmer until it’s reduced by half. Let me know when you do! It’s so simple and so tasty that we doubled the batch and had it the next day. So crazy! Bruschetta is a hot topic lately. This looks tasty! Looks delicious!! I have a bunch of tomatoes ripening and I think I know what to do with them! Ooooh! Those would be perfect for this! Enjoy!